New York : Orchard Books, 2005. 253 p. : map ; 18 cm. When she finds the key to a secret passageway leading out of the walled city of Bridewell, twelve-year-old Alexa realizes her lifelong wish to explore the mysterious forests and mountains that lie beyond the wall. 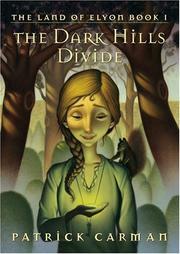 The Dark Hills divide / Patrick Carman. Reading Counts 6.0 14 Test #Q36075, Available. Carman, Patrick. Land of Elyon ; bk. 1. 100 ME:PersonalName 1 $a Personal name Carman, Patrick. $c Statement of responsibility Patrick Carman. 250 Edition $a Edition statement 1st Orchard Books ed. 520 Summary $a Summary, etc. note When she finds the key to a secret passageway leading out of the walled city of Bridewell, twelve-year-old Alexa realizes her lifelong wish to explore the mysterious forests and mountains that lie beyond the wall. $z Public note Test #Q36075, Available. 800 SAE:PersonlName 1 $a Personal name Carman, Patrick.